What's really neat about the KSP forum is we have all kinds of threads. We have threads about what song is stuck in our heads, we have an entire subforum discussing our favorite mods, movies, and even a thread for dating advice. But what I find is missing is a thread about... FOOD. We know that our Kerbals love their snacks, but well, what do we snack on? Come on, admit it. We all have those strange moments in our lives where we get a strong craving for a certain food. And if you're like me, that food (or beverage) craving can be triggered by events, a commercial on television, or even just catching a whiff of something in the air. At other times, those cravings seem to come at us from nowhere and won't go away, no matter what we try. There are some of us who try to resolve the craving by eating something else, a healthier choice, but all it does is make us crave what we want even more. 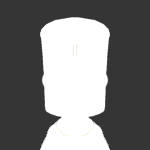 So, at this moment, what is the food/beverage item you're craving? Everyone around me is munching on Ice cream right now. I absolutely hate Ice cream, but considering they are eating ice cream in a waffle sandwich, i now crave waffles. I haven't eaten waffles in a long time, i sometimes eat the cheap, vending machine Belgain waffles at school, but i absolutely hate those, i only eat them when i don't have anything else to eat, because those things are the Nuclear Fuel of the vending machines compared to all the ricecakes and candy-bars. I crave waffle-waffles (don't know what you actually call them) with syrup drizzled on top, oh, and don't forget the fried chicken! Last time i ate that dish was about a year ago, when i visited South-East England. I hope im going back there this year, so i can absorb that food once again. Well, right now (and since a week), I'm just dreaming for a good and true couscous... one like only the mother of a Moroccan friend of mine was knowing how to make. True Italian food is missing to me, also. Removed a "bad word", as it probably was forbidden. Waffles are always good. My daughter loves it when I make them homemade. Last weekend, I played around with the recipe last Saturday to answer her challenge. She wanted me to make waffles which tasted like the mint chocolate chip ice cream. Oh, and mission accomplished! Man, I love food. I've been wanting to do a food-themed thread for a while. I love to cook and bake. Couscous is great - as long as the person knows how to make it. I've had some that probably could best described by the profane word you used that you edited out. And funny you should say that about Italian food. I love Italian food - and am learning how to cook Tuscany style recipes. And Jelly Beans, I can't say no to Jelly Beans. Oh, I love the Cadbury's with fruit and nuts... best chocolate in the world. Anyone ever tried that salty licquorice from Scandinavia? You might like it if you like torture, hell and awful things. @p1t1o: Ah, the good ol' Swedish Fish! Early on, was it Gummy Bears or Swedish Fish that had the ethylene glycol in them? 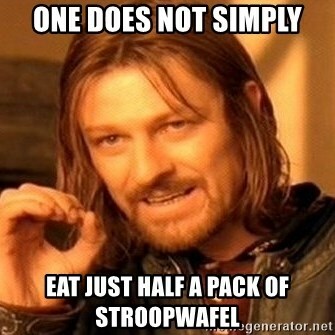 Stroopwaffels? Or just normal waffles? Currently I've been having these amazing dried mango things. But a nice bit of steak would be nice. I forgot about that. It almost ruined Haribo. Also, ice cream. THE BEST flavour of ice cream is, of course, mint chocolate chip. @adsii1970 Mint flavoured waffles? Sign me up!!!! SACRILEGE!!! I don't like mint as an ice cream flavor. Its horrible. But I really like coffee ice cream. Coffee flavored ice cream of course. And have you tried Halo Farm coffee ice cream? Thats real good if you ask me. Blue Moon is the best. Never had this or heard of this. What is it? I haven’t tried that. The problem is it may not be available where I live. Not sure, what exactly they are, but the snack'o'mat are on the cabin wall, and supplies appear somewhere from the greenhouse.